Blowout Sale! Up to 51% off on Raw Building Materials at The Dead Bell. Top brands include Edge Supply. & Edge Supply. Hurry! Limited time offers. Offers valid only while supplies last. White Melamine 7/8" X 250' Roll Preglued, White Edge Banding, Flexible White Tape, Easy Application Iron On with Hot Melt Adhesive. Smooth Finish Melamine Edging. Made in USA. Birch Wood Veneer Edgebanding Preglued 7/8" X 250' Roll, Iron on with Hot Melt Adhesive, Sanded to perfection. Easy application, Made in USA. Walnut Preglued 13/16" X 250' Wood Veneer Edgebanding Roll, Iron on with Hot Melt Adhesive, Sanded to perfection. Easy application, Made in USA. Birch 3/4" X 250' Roll Preglued, Wood Veneer Edge banding, Iron on with Hot Melt Adhesive, Flexible Wood Tape Sanded to Perfection. Easy Application Wood Edging, Made in USA. 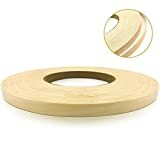 Maple 2" X 10' Preglued Wood Veneer Edgebanding Roll - Flexible Wood Tape, Easy Application Iron On with Hot Melt Adhesive. Made in USA. Walnut Preglued 2" X 50' Roll Wood Veneer Edgebanding - Iron on with Hot Melt Adhesive. Sanded to perfection. Easy application. Made in USA. White Melamine Edge Banding Preglued 7/8" X 10' Roll - Iron on - Hot Melt. Made in USA. Maple Pre-finished 7/8" X 500' Automatic (Non Glued) Wood Veneer Edgebanding. Clear UV Laquer Finish. Made in USA. Maple Pre finished Preglued 13/16" X 50' Wood Veneer Edgebanding. Clear UV Laquer Finish. Made in USA. Maple 13/16" X 50' Preglued Wood Veneer Edgebanding Roll - Flexible Wood Tape, Easy Application Iron On with Hot Melt Adhesive. Made in USA. Walnut Preglued 1/2" X 50' Roll Wood Veneer Edgebanding - Iron on with Hot Melt Adhesive. Sanded to perfection. Easy application. Made in USA. Walnut Preglued 1/2" X 25' Roll Wood Veneer Edgebanding - Iron on with Hot Melt Adhesive. Sanded to perfection. Easy application. Made in USA. Birch Pre Finished Preglued 3/4" X 50' Wood Veneer Edgebanding. Clear UV Laquer Finish. Made in USA.